Worthing United Football Club scored an injury-time winner to beat East Preston 2-1 in the FA Vase this evening as they returned to action on an emotional day at Lyons Way. 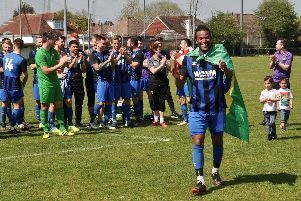 The game was Mavericks’ first since players Matt Grimstone and Jacob Schilt died in the Shoreham Airshow crash and the match was in memory of the popular duo, who helped United lift the Sussex County League Division 2 double last season. The local football community were out in force, with around 1,000 people in attendance, to show their support. Jack Hayward gave United the lead on the hour, before East Preston’s Bruno Costa levelled in the first minute of injury-time with a drive into the roof of the net after a mazy run. However, Mavericks went straight down the other end and when EP keeper Darren Ford was unable to hold Paul Elliott’s 20-yard shot, Sam Blundell pounced to net the winner. United manager Nigel Geary said: “Everything hit me about five minutes before kick-off. “I went to see the families before I gave my last couple of words about ten minutes before the game. I then went into the dressing room and I was talking to the boys and I welled up and I was welling up in the minute’s applause as well. “Fair play to the players because they were going through the same. To put in a performance like that without playing for three weeks and when we’ve only been training for a week, while East Preston have played four, five, six games, just fair play to the boys. “You saw that we were rusty but as the game went on, we got better and better, especially in the second half. We came out and we had a 20 minute spell where we scored the goal and maybe could have had two more to put the game to bed but again that’s rustiness. United captain Hayward said: “It was tough all week as we’re always thinking about the boys. Once we got back training, our heads were back on it and we’ve been trying to get our fitness back. Blundell, who got the winner, said: “It was a great result in the end and it was meant to be - a last minute goal. It was just meant to happen. “It’s been very hard the last few weeks, playing football brings all the boys together and this has helped get everyone through it. Mavericks vice-chairman Mark Sanderson added: “I’m so proud of the boys just for managing to walk on the pitch. East Preston head coach Paul Ettridge said: “We just wanted to put on a performance, so the people who came went home thinking that was a decent game for Matt and Jacob. “They would have enjoyed that game and, for the neutral, it was a good game of football. “The right thing has happened today under the circumstances. It was a good way for them to finish the game. “We knew the majority of people here would be supporting Worthing United and if I wasn’t involved today, I’d have been doing the same. I’d have been here as a supporter, cheering them on for the day.